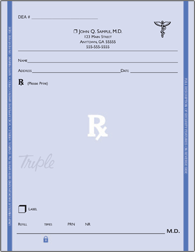 Every Triple i Prescription Pad and Paper product listed below meets and exceeds the standard set by the appropriate State or Federal governing body. Attention California Prescribers, all CA Schedule II pads are 100% compliant with the new law, AB 1753 (Low, Chapter 479), effective January 1st, 2019, which requires a unique serialized number for all controlled substance security prescription forms. For everyday use, these pads are printed on the whitest and smoothest paper on the market. 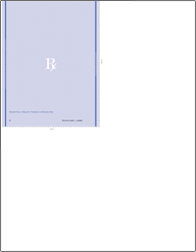 Contains the Triple i VOID pantagraph with visible RX symbol, erasure protection, artificial watermark and meets and exceeds Federal Centers for Medicare and Medicaid Services for writing your Medicaid-patient's scripts. 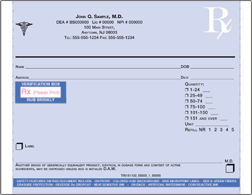 New Jersey Prescription Blanks (NJPB) MD-DO-DPM-DVM, etc. 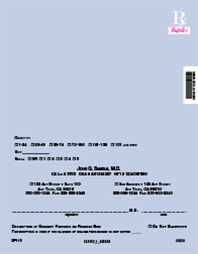 These pads meet the requirements of the NJPB program, most recently updated in August 2014, that require individual barcoding of every script. These pad sheets contain 11 industry-recognized features and are the most secure script in the Triple i product line. Used most often by doctors in states which don't already have a special exemplar for Schedule II Controlled Substance prescriptions to prevent counterfeiting. These 5-1/2" x 4-1/4" pad sheets contain the same features as our Tamper-Resistant product with a Thermographic "Triple i" heat-activated feature added. They meet or exceed the standards set by the California Department of Justice Health & Safety Code 11162.1 et seq. for the writing of Schedule II Controlled Substances in California, including the new law AB 1753 requiring a unique serialized number as of 1/1/2019. These 4-1/4" x 7" pad sheets contain the same features as our Tamper-Resistant product with a Thermographic "Triple i" heat-activated feature added. They meet or exceed the standards set by the California Department of Justice Health & Safety Code 11162.1 et seq. for the writing of more than one Schedule II Controlled Substance per script in California, including the new law AB 1753 requiring a unique serialized number as of 1/1/2019. 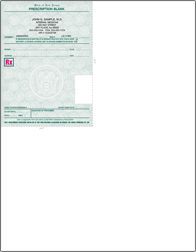 This 8-1/2" x 11" sheet is formatted for use with your office laser printer and contains the Triple i VOID pantagraph with visible RX symbol, erasure protection, artificial watermark and meets and exceeds Federal Centers for Medicare and Medicaid Services for writing your Medicaid-patient's scripts. 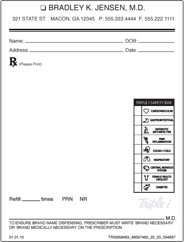 This 8-1/2" x 11" sheet is formatted for use with your office laser printer and contains the security features required for the New Jersey Prescription Blank (NJPB) Program. 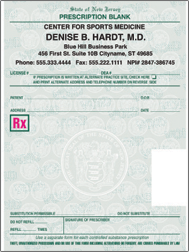 The 4" x 5-1/2" script is located in the top left quarter of the paper and can be removed by perforation per NJPB statute. These 8-1/2" x 11" laser script sheets are formatted for use with your office laser printer and contain the same features as our Tamper-Resistant product with a Thermographic "Triple i" heat-activated feature added. They meet or exceed the standards set by the California Department of Justice Health & Safety Code 11162.1 et seq. for the writing of more than one Schedule II Controlled Substance per script in California, including the new law AB 1753 requiring a unique serialized number as of 1/1/2019. These pads contain the same features as our Tamper-Resistant product but formatted to meet or exceed the guidelines for writing Schedule II Controlled Substances in the State of Kentucky. These pads contain the same features as our Tamper-Resistant product but formatted to meet or exceed the guidelines for writing Schedule II Controlled Substances in the State of Maine. These pads contain the same features as our Tamper-Resistant product but formatted to meet or exceed the guidelines for writing Schedule II Controlled Substances in the State of Wyoming. These pads contain the same features as our Tamper-Resistant product but formatted to meet or exceed the guidelines for writing Schedule II Controlled Substances in the State of Indiana. 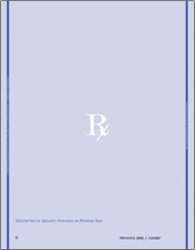 These pads contain the same features as our Tamper-Resistant product but formatted to meet or exceed the guidelines for writing Schedule II Controlled Substances for the State of Washington Department of Health. *All pad types shown above are also available with 2-part carbonless sets. **Triple i is an Approved Printer in New Jersey and as such also offers the APN, PA, OPT, Eyewear, Midwife, and Healthcare Facility specific pad types. See our ordering page.